The Viking G5 tops the industry in linear actuator swing gate systems. New generation of gate operators from Viking Access, G-5 allows you to enjoy higher levels of efficiency, workability and functionality. G5 is now powered with a V-flex control board, including a speed control and LCD display. This model is an epitome of durability and can handle gate up to 2,000 lbs. It also features new and extended lead screw for 135 degree of travel at 100% duty cycle. The G-5 linear swing gate operator is a complex machine that is very easy to install, gives unmatched energy efficacy and higher safety levels. This gate operator has amazing features that helps it stand out and are unmatched in the industry. The G-5 is now equipped with a digital manual release and comes with a pre-wired setting to allow for easy installation. 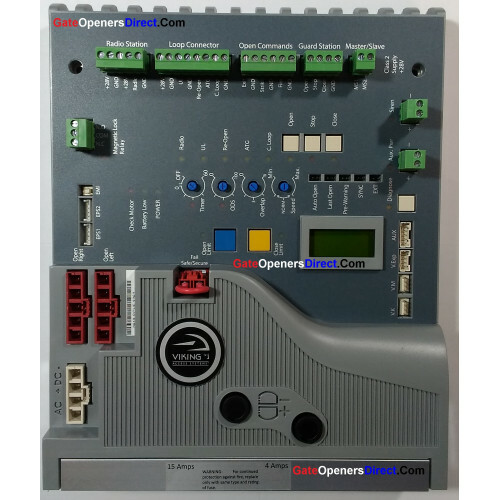 The gate operator comes in a modern sleek design. This type of gate operator works best in both residential as well as commercial settings. In this newest model put forth by the Viking, they have increased the warranty time for the new G5 linear swing gate operator to 4 year in residential setting whereas 3 year in commercial setting. Maximum Gate Weight: 2,000 lbs.